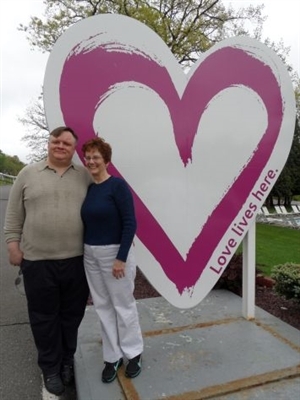 Many people liked the photo of Bette Lynn and me in front of a heart sign from last week's post. Some commented on the weight I've lost since last May, others on how happy we looked, a couple wanted to know about the sign and the Cove Haven resort where "Loved Lived". But the most interesting part of the photo cannot be seen anywhere in the photo but is a critical part of it: The Photographer. I've asked the person who took this photo to raise his hand. Yes, that is Ray Simpson. In addition to being our vacation photographer, he is the "cop" and lead singer of the Village People.. This is how we got our picture taken by such an icon. We wanted to have a picture by the heart sign at the resort. As I stood by the sign, Bette Lynn walked back the path and asked the couple walking behind us if they would take our picture by the sign. She offered the man our camera. Posing awkwardly by the large heart sign, I wondered what was taking so long. Instead of taking the camera, the man just looked at the camera in confusion. Finally, the woman with him, explained the project to him, "They want YOU to take THEIR picture." That explanation helped! He smiled, said "Oh!" and good naturally took several photos of us. He had us review the pictures and while we were, offered to take more if we wanted. We declined his thoughtful offer and thanked him. We thought nothing more of the hesitant turned enthusiastic photographer until he walked out on stage that night with the rest of the Village People. Bette Lynn, leaned over to me and shouted above the roar of cheers and song: "The cop took our picture!" I was confused now, (he had a microphone not a camera) then I realized the one who was working behind the scene was now stage front. Looking at the photo, even being in the photo, doesn't tell the whole story of who is involved in the big picture. Hope you look behind the camera and get to meet who is working behind the scene.